On the southern side of Barcelona, at the foot of Montjuc (Jewish mountain), lies the working-class neighbourhood of Sants. Once an industrial quarter with an abundance of textile factories, this area has now become largely residential and commercial, with a 4 km-long shopping boulevard, the busy Carretera de Sants, which extends into the Creu Coberta, as the areas main attraction. Full of family-run bars, cafs and restaurants, the tree-lined C. de Sants also boasts over 500 shops, and two municipal markets as well as banks, libraries and civic centres. In keeping with the districts recent history, the stores here deal predominantly in textile products, as well as shoes, cosmetics and leather goods. The citys international railway station is here, the Estaci Barcelona-Sants, and there are three underground lines and 18 city bus routes which connect Sants to the rest of town. Limited parking facilities are available. Sants is bounded to the north by the Avenida del Paral.lel, home to various theatres and music halls like the Molino. Not many tourists visit this part of Barcelona, opting instead for a trip to the top of Montjuc, taking the cable car up from Barceloneta. 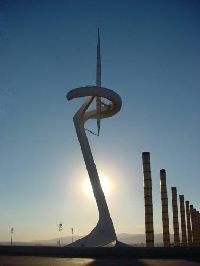 The site of the 1992 Olympics, the Montjuc park offers excellent public sporting facilities like the swimming pools at Piscinas Picornell, tennis courts and walking trails as well as the Olympic stadium, now home to the Espanyol football club. On the summit the Castell de Montjuc, a fortress built at the end of the 17th century on the site of the ancient Jewish cemetery, is now home to the Military Museum. When the World Fair was held in Barcelona in 1929, the mountain was remodelled and numerous museums and galleries dot the verdant gardens on the hillside most notably the Poble Espanyol, the re-creation of a composite Spanish village. Near the top, the Fondeci Joan Mir houses a comprehensive collection of this famous Catalan artists works. The Museu Nacional dArt de Catalunya and the exhibition grounds of the Fira de Barcelona are located further down. After sunset, Monjuc becomes a lively night spot with its many bars,clubs and restaurants and tourist attractions like the Magic Fountain.